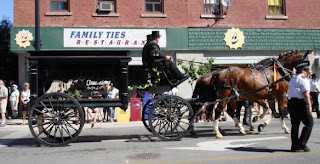 The History Hare has written about the Horse Drawn Hearse "The Last Ride" in the most recent issue of the Graveyard Rabbit Online Journal Above is an example of an old fashioned horse drawn hearse during the City of Owen Sound 150th Parade in August 2007. Catherine died 12 December 1927 in Wiarton, Ontario. She was born in Land's End England, the daughter of William Coad and Catherine Thomas. Her son, R. J. Trethewey of London, Ontario was the informant. "Grey and Bruce Trust Company" Women's Institutes of Grey County, Annan Branch, digital image; Grey Roots (http://www.greyroots.com ; accessed 26 January 2010). Catherine Tretheway Ontario death registration #009402 (13 December 1927), digital image; Ancestry.ca (http://www.ancestry.ca ; accessed 26 January 2010), citing microfilm MS 935 Reel 346, Archives of Ontario, Toronto. This is not my family. Future postings will continue with more Trethewey monuments. As with all research, what seems like it would be a straight search for information turns out to be slightly more complicated. In 1891 according to the census, Catherine, Angus and daughter Mary are living in Sydenham Township. In 1901, Angus is shown in the census with his daughter Mary (listed as Minnie) and her husband Milton Bebee in Owen Sound. Angus, according to his tombstone and the Greenwood Cemetery online database his year of death is 1906. The database gives the date of death as 13 August 1906 with the burial the following day. Despite trying many different searches, I did not find the death registration for Angus. To confirm the connection between the Gunn family and Bebee family, I searched for a marriage registration for Milton and Mary. I found two registrations for them, two years apart with two different dates and places of marriages. Their ages increased appropriately by two years. Milton's parents didn't have common first names and in both registrations they are the same.His father was Steadman and his mother Tryphosa. The first took place in Toronto on 5 July 1892. The second took place 17 January 1894 in Sydenham Township. Each had different witnesses. As with all research, you end up with questions. Why were their two marriage registrations? Mary Christina Ellen Bebee Ontario death registration #017205 (15 January 1930; digital image, Ancestry.ca (http://www.ancestry.ca ; accessed 19 January 2010), citing microfilm MS 935 Reel 389, Archives of Ontario, Toronto. May was my dad's oldest sister. She was born in Small Heath, Birmingham England on 28 May 1904. The following year, the family moved to Grey County, Ontario. In 1929, she married Jack Litherland. I am not sure what year they moved to England but she did return to Canada. In her latter years, she lived with her mother who predeceased her by only a month. May died 17 June 1967. She is buried in Greenwood Cemetery, Owen Sound.